Saluton and it is NOT your regular host, Tyson Saner, this time around but former host, executive producer, and folding plastic room divider Marc Hershon. That’s right. I will be filling in for Tyson for this, Epi186, and another one or two episodes as well because Mr. and Mrs. Saner are welcoming their first baby into the world! Congratulations from all of us here at Succotash to all of you Saners – old and new – up in Humboldt County in Northern California. Tyson needed to take some time away from his duties as host of this show and I volunteered to step in for a bit so here I am. If you would like to pass along your congratulations to Tyson, feel free to ping him on Twitter @RevT23 or you can email him at Tyson@SuccotashShow.com. You can even call our tollful Skype line and leave him a cheery message at (818) 921-7212. If you don’t recognize my voice, that’s okay. I started Succotash back in 2012 and, after seven years of hosting the show, stepped away from the microphone almost exactly a year ago to make way for Tyson to take the reins. I’ve been in the background as the executive producer – posting the shows online and handling all of our social media stuff. And I’ve been busy trying to get a couple of new projects off the ground, too. 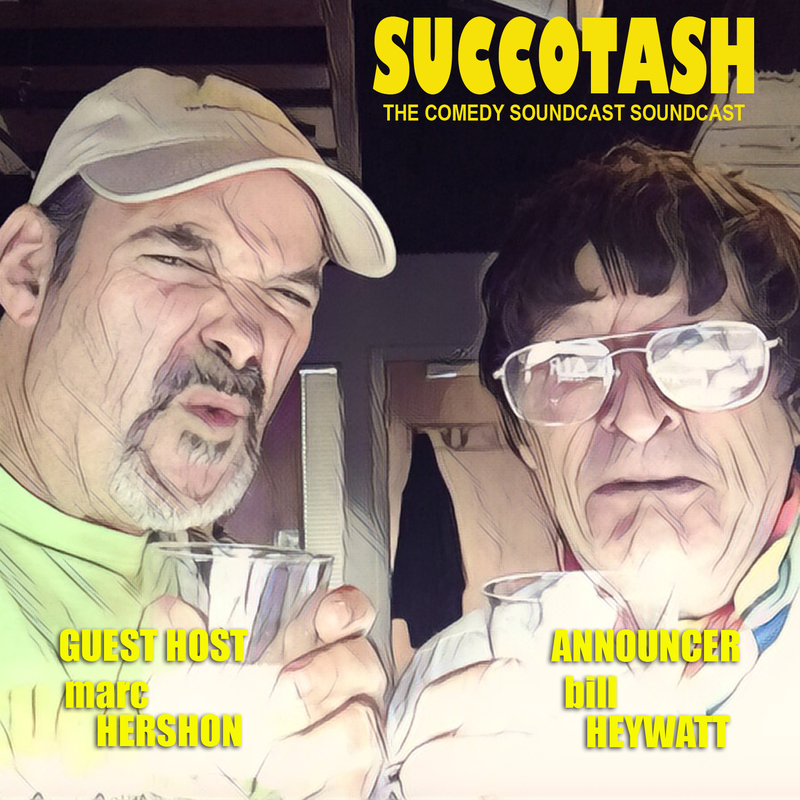 If you’re new to Succotash, the Comedy Soundcast Soundcast, this is where we feature snippets from other peoples’ comedy soundcasts in order to let you know what’s going on out there in the incredibly crowded field of soundcasting. We’re like a Whitman’s Sampler of rich, chewy soundcast goodness. This episode we’ll be featuring clips from Armchair Expert, Conan O’Brien Needs A Friend, Dave Hill’s Podcast Incident, The Smartest Man in The World, What A Time To Be Alive, and The Young & The Weary. BTW, Succotash is brought to you by Henderson’s Pants new Toddler Trousers AND Trumpoetry.com. One segment we WON’T be featuring this episode — and may not be for the foreseeable future — is our long-running Burst O’ Durst with political comedian and social commentator Will Durst. Will’s been doing this segments for YEARS, literally out of the goodness of his heart, and he’s taking a much-needed hiatus. And he’s not sure if it’s worth coming back. We can’t afford to pay him for his excellent commentaries because we don’t have paying sponsors. We are totally listener-supported but no one clicks on our Donate button at SuccotashShow.com, or clicks on the Amazon banner at the top of that same page, or buys any of our merch. So we’d love to keep bringing you Will’s amazing take on the political and social landscape but the coffers are empty. If you’d like to hear more Durst, let us know at durst@succotashshow.com. And if or until he rejoins us on Succotash, you can always check him out at HIS website, at WillDurst.com. Enough of that. Let’s get into the clippage, shall we? One of the other things I do besides executive produce Succotash is provide weekly reviews to Vulture.com’s This Week In Comedy Podcasts. That online column used to be on Splitsider but it was bought by Vulture and all us reviewers made the jump over there, too. Recently I’ve reviewed several episode of the relatively new Conan O’Brien Needs A Friend soundcast and it’s pretty damned entertaining. The set up is that Conan O'Brien are been hosting his TV talkshow for along time but never really has time to make friends will all of his many celebrity guests. This soundcast is meant to be the cure for that. Recently, though, Conan had an actual friend on the show, none other than Adam Sandler. They’ve known each other for over 30 years, were on Saturday Night Live together, and even live in the same neighborhood in Los Angeles. In our snippet, they talk about their approaches to dealing with audiences. I figured it was time to revisit The Smartest Man in The World, the soundcast from past Succotash guest Greg Proops, best known, perhaps, from Whose Line Is It Anyway. He’s also a personal friend and improv cast member with yours truly, and I think he’s one of the fastest, funniest, people around. In this clip, Greg and his wife, Jennifer, soundcast from the Fortress of Proopitude and, in our sniplette, they get into some old Hollywood lore and hijinks. A show that popped into Soundcastland this past year or so is Armchair Expert, hosted by actor Dax Shepard. Although his interviewing style is a little scattershot, I enjoy the loose informality he has with his guests, most of which he knows from his rambling around Los Angeles for a number of years. Just recently he hosted Sarah Silverman for a lengthy and revealing chat. Another thing I like about Dax is that he doesn’t mind venturing into areas that other hosts might feel uncomfortable about – as in the segment we're featuring, where he talks to Sarah about his reaction to her sexuality. It is so hard to keep up with the avalanche of soundcasts, comedy and otherwise. Even as someone whose job is reviewing the damn things, I am constantly finding not just new shows, but shows that have been on for a while that completely slipped beneath my radar. One of those is What A Time To Be Alive. It features three hosts — Eli Yudin, Kath Barbadoro, and Patrick Monohan — and, as they say on their Patreon site, it’s “the only podcast that counts down all the things each week that make you say the title of the podcast.” In our clip, the trio get giddy over the topic of nunchucks and what a ridiculous weapon it (they?) makes in the wrong hands…or even the right ones. Our final entry this episode is from a new soundcast — just three or four installments in — and it’s called The Young & The Weary. Great title. And apropos. The "Young" is 32-year-old Jeremy Pinsly, a comedian raised in Nashville, now based in New York. The "Weary" is 88-year-old Dev Rogers, a former occupational therapist, an author, and a budding comedic actor from Buffalo, New York — she’ll be appearing in Comedy Central's Broad City this year. As these two have gotten to know each other during the first few episodes, they’ve kind of revealed a lot. Like how they each lost their virginity. Our clip is from the third episode, “Bad Language”, and they chat about the use of dirty words in comedy. And if you can’t afford to give up the loot then how about rate and review Succotash Show up on our listing on iTunes? Doesn’t cost you anything than your pride and vanity. It has been a pleasure spending this time with you, filling in for our hiatusing Tyson Saner. I may be back for another one or two of these but fear not – Mr. Saner will be back in the Big Chair before you know it! A couple of reminders before I skedaddle. If YOU’RE a comedy soundcaster and would like to hear a clip of your show on our show, stay tuned for the closing credits where our esteemed announcer, Bill Heywatt, will give you details on how to upload those clips directly to us. And the other thing I want to urge you to do — whether it’s to your family, loved ones, friends, or even enemies — is to please pass the Succotash! Felicxan Novjaron, estas mi Tyson Saner, your host for this special "First Succotash, The Comedy Soundcast Soundcast of the Year" edition of Succotash, The Comedy Soundcast Soundcast… and - let's not kid ourselves - this "Chats" episode very likely could not have come at a more appropriate time. Your friends in podcasting, Phil Leirness and Dean Haglund of Chillpak Hollywood Hour agreed to sit down with me earlier this week to discuss their brilliant independent film, the dark comedy The Lady Killers. If you are an adult and have not seen this film yet, I believe that you should. It explores the theme of Toxic Masculinity and its symptoms of "Sexual-Conquest-as-Friendly(? )-Competition" as well as the plausible consequences involved when it all "stops being fun" and starts being deadly. Just for clarification, this film is NOT a remake of the 1955 film The Ladykillers. THAT film WAS remade in 2004 and directed by Ethan and Joel Cohn. This more recent film was released in 2017 and its title is comprised of 3 words. If you Google it as three words, those words being "The", "Lady", and "Killers" Google will ask you if you meant to search for those other films. In addition to OUR interview with the hosts of YOUR Chillpak Hollywood Hour, I've got a single Burst O' Durst from Raging Moderate Will Durst, and selected reading from TrumPoetry.com! Chillpak Hollywood Hour can be heard on Blog Talk Radio, Stitcher and iTunes, and you can find the archive of "Chillpak Hollywood Hour" at chillpakhollywood.com. The show can be reached on Twitter at @DeanAndPhil, Phil at @philleirness and Dean at @dhaglund and remember you can find the website of their 2017 film "The Lady Killers" (three words) at theladykillersmovie.com where you can purchase the film on disc as well as be updated on theatrical screenings of The Lady Killers when those are announced. If you want to see it at home or on your device there are MANY options including iTunes, Google Play, VUDU, Microsoft Store, Amazon Prime Video, Flix Fling, Direct TV, Fandango NOW, Verizon's Watch Fios service, YouTube, MCTV and Steam. I'd also like to thank you, the listener for spending time with us this episode and every episode you choose to listen to. You are nothing if not spoiled for choice of what to listen to…and I am nothing without you. Ok, that's a bit much. I shouldn't say I'm nothing even when attempting to compliment you. It's unhealthy behaviour and I made a New Year's Resolution to be healthier both physically and mentally… so we'll see how that goes. I hope your 2019 shapes up to be a delightful one and I also hope that the film The Lady Killers becomes part of the larger conversation about how humans treat each other… so we'll see how that goes as well. Thank you again for listening and if I could ask something only slightly more of you it would be to tell other people about this program as well as the programs featured within for that is what we mean when we ask you to (Please) Pass The Succotash.